Forever Drive by Supermono Limited is a highly anticipated iPhone app that delivers a futuristic driving experience. On the iTunes App Store, it’s completely free, and it’s compatible with the iPad and iPod touch as well as the iPhone. What distinguishes this application from other racers, particularly mobile ones, is that the player races on tracks that he or she creates using the built-in track editor. 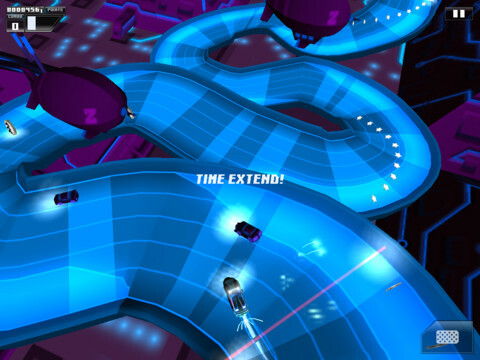 Moreover, with Internet access, the app seamlessly connects you with tracks created by other players, hence the name Forever Drive. You can drive non-stop and never hit a boundary because the app will simply link up another section of track. More importantly, this design approach removes the redundancy that plagues other racing games, especially on storage-limited platforms. The developers at Supermono also understand that RPG elements make everything better. So what they’ve done is integrate a leveling system. As you race, you gain XP. When you accrue enough XP, you level up. Leveling up isn’t just window dressing. It gives you access to a wide range of new cars. It also provides other benefits, such as different paint schemes and registrations plates. 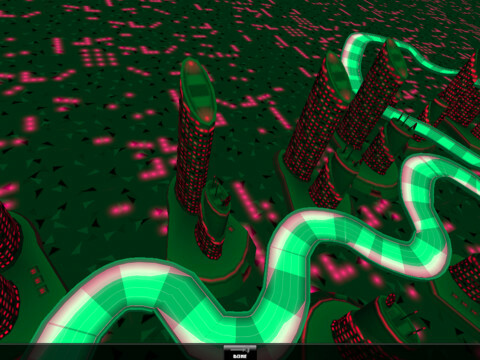 Forever Drive is an ambitious project, so how is it that they give the application away free? Well, players have the option of purchasing XP with real money. This is a nice approach. One on hand, it maximizes the multiplayer experience. Anyone who wants to play can download it and do so. On the other hand, unlocking all cars and perks takes quite a bit of time. If a player chooses, he or she can avoid all that by purchasing the XP, essentially paying for the game . In terms of control and gameplay, Forever Drive provides a terrific experience. This isn’t an attempt at an authentic driving simulation. But within the context of Forever Drive, the feel of the vehicles is intuitive and responsive. This is vital for the success of an app like this because outside of your own tracks, there is little opportunity to master tracks. You never know what the game will throw at you next. Forever Drive is not perfect, and bugs and other technical issues mar the experience. Keep in mind that we’ve based our initial rating on this troublesome experience. If it weren’t so buggy, we’d have given it a much higher score, and it would be at the top of our list of favorite games. In the meantime, FD will sometimes simply refuse to start, and will often crash to the home screen for no apparent reason. AppSafari review of Forever Drive was written by Joe Seifi on October 13th, 2011 and categorized under App Store, Fun, Games, Racing, RPG. Page viewed 3873 times, 1 so far today. Need help on using these apps? Please read the Help Page.